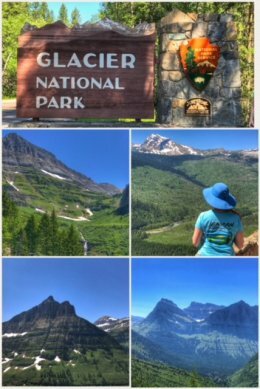 Glacier National Park, the 16th national park we have visited on this trip, but first in our hearts… because it was the first national park we visited together — and a perfect long weekend of nature, fun, and love. But that was then (back in November 2016), and Going-to-the-Sun Road had already closed for the season… so this trip was partly to revisit our wonderful park and bask in our love, but also to explore more parts of it than we could during that first visit together. And just wow. 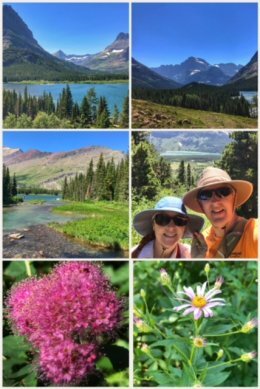 We had several days of amazing hikes, beautiful vistas, and bountiful wildflowers. We made a quick stop to the Apgar Visitor Center in West Glacier to grab some maps and get last-minute trail recommendations. 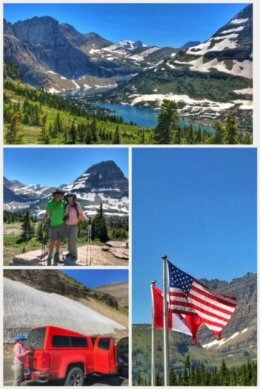 We had previously hiked the Trail of the Cedars (which is indeed a must-do hike) near Avalanche, so we headed up the Going-to-the-Sun Road with the goal of making it to Logan Pass and the Hidden Lake Trail. While the highlight of the trail is seeing the glacial lake, several mountain goats (including two mommas and their babies) stole the show. We found Glacier in the summer to be quite different than Glacier in the fall — as this time around we had to struggle to find parking spaces in popular places, such as Logan Pass. 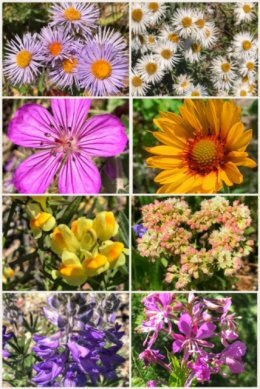 But… by far making up for the increased traffic was the amazing bounty of wildflowers we got to experience in all areas of the park. 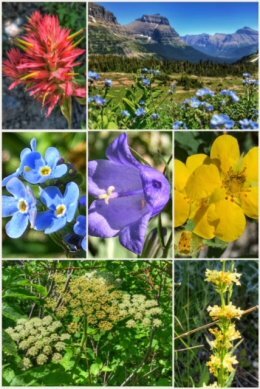 We spent two days on the west side of Glacier, and were rewarded with many flowers along the drive and along our hikes. We ended our visit to the west side with a fun hike on the Johns Lake Loop Trail — and a quick stop to the south end of Lake McDonald, which is also a must-see stop. 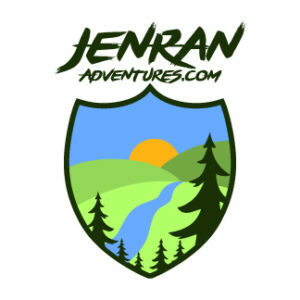 Johns Lake Loop Trail is a fairly easy 2-mile loop that goes around a tiny little lake and then across the Going-to-the-Sun Road, and along McDonald Creek — and includes Sacred Dancing Cascades and McDonald Falls. You can find the trailhead about 1.3 miles east of the McDonald Lodge on the Going-to-the-Sun Road. If the parking area is full, you might find space just diagonally across from the trailhead at the corner of McDonald Road. From there, we went to Apgar Picnic Area on the south end of Lake McDonald, Glacier’s largest lake at 10 miles long, 1 mile wide, and almost 500 feet deep — formed by Ice Age glaciers. 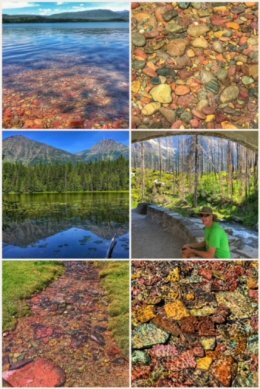 If you have never seen them, the rocks in this lake — and other areas of Glacier — are beautiful and multicolored. On the other leg of this stop, we ventured up to Many Glacier, in the northeast part of the park… a section neither Jen nor Ran had ever visited. As we pulled into the park, we encountered Sherburne Lake, which is actually a reservoir that provides irrigation water to north central Montana farms… but with the mountain backdrop, still a beautiful stop. As we continued into the park, we were unexpectedly rewarded with great fields of wildflowers, waving in the wind that seems almost constant in this part of the park. We pulled over and admired God’s beautiful creations for quite a few minutes — snapping lots of pictures at the same time! Perhaps because it was such a surprise, or perhaps because it was simply so peaceful and stunning, these fields are a top highlight of the trip! Next up, we pulled into the Apikuni Falls Trailhead, just under 3 miles west from the park entrance. 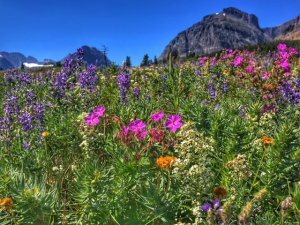 The 1-mile (one-way) hike starts in a beautiful wildflower meadow known as Apikuni Flat. You then pass through an Aspen grove before some serious climbing through pine forest and rocky outcroppings before finally reaching the falls; be prepared with water because while this hike is short, you climb about 500 feet in elevation to reach the falls. The falls themselves plunge off a cliff face in two separate tiers: the first is a free fall off the top of the cliff, while the second is more of a cascade. Next up, we drove over to Many Glacier to hike the Swiftcurrent Nature Trail, which travels around Swiftcurrent Lake and Lake Josephine. The views are wonderful, with the mountains rising about 3,000 feet around the lakes. 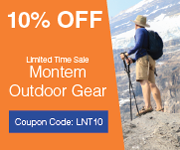 You can also continue hiking all the way to Grinnell Lake and Grinnell Glacier. The nature trail is about a 2.6 mile loop, of which we hiked about 2 miles before calling it quits; hiking about 4 miles is our daily limit and the falls hike earlier in the day definitely taxed us! The trailhead for this trail is a bit hard to find (and is poorly marked), but if you walk to the west side of Many Glacier Hotel (and near the lake), you will eventually find it. If so inclined, you can also book two boat adventures — one across Swiftcurrent and other across Lake Josephine — and then hike to Grinnell (or simply return back to the Many Glacier Hotel dock). 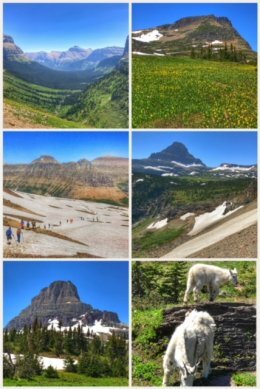 We absolutely enjoyed all the parts of Glacier National Park we visited — and we plan to explore more areas and hike more trails in future adventures to “our” park. 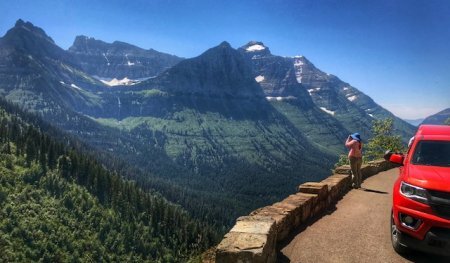 The west side is the more well-known part, but if you have the time you really should visit Many Glacier too. 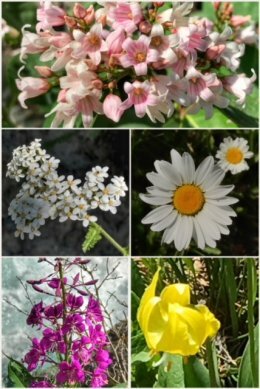 And while July will always be a busy time at the park, it is also the best time to see this wide and bountiful collection of wildflowers. Next up? A few more adventures in Montana before we head for the first-ever venture into North Dakota!